Weekly Update 2019-13: A very special moment in my music memory provided by Ministry of Sound, preserving such moments through Spotify mega-playlists (150+ songs) and the beauty and strength of a rail bike. This was a very special music epoch for me, let me paint the scene. The year is 2006. I had just discovered MSTRKRFT, Justice, Crystal Castles, Digitalism, Boys Noize and Simian Mobile Disco. The music was hard, it was loud, heavy on the synth, repeating lyrics, and definitely did not impress my parents. I distinctly remember trying without luck to order Toronto-based MSTRKRFTs The Looks at my local HMV, only to be returned with looks of confusion from uppity store employees. Resigned to pirating music on an old PC like the rest of the indie music fans of my time, I somehow came across Ministry of Sound's Mashed III. Ministry of Sound's Mashed III (2006) mixed by Tonite Only and Riot In Belgium. Ministry of Sound is a multimedia entertainment business based in London with a nightclub, shared workspace and private members club, worldwide events operation, music publishing business and fitness studio. The Compilations business was first established in 1993 with the release of Sessions Volume One, a compilation album of dance music mixed by Tony Humphries. The album was a commercial success. The business has now sold more than 55 million compilation albums worldwide. Their Mashed compilations were my first real foray into electronic music from all over the world (especially Europe). France (of course), Sweden, Germany, the UK, Switzerland, once I had listened to the third volume about twenty times through, I went in search of the other four. I was never able to locate a ripped copy of the first volume, but I was able to immerse myself in approximately 200 tracks of Europe's finest mashup club mixes. It was like a domino effect; I would look up the bands featured, the artists who remixed their songs, and each volume of Mashed itself was curated by an electronic musician. To this day I still haven't exhausted the listening power of these songs, nor have I finished my discovery of all the featured musicians and their offshoots. I recall that I couldn't find a version of the second or fourth volumes as anything other than a single, uncut track, so I spent hours of my teenhood working painstakingly between Audacity and Youtube to cut the tracks perfectly. I keep these files on my iPhone all the time because they're (unsurprisingly) not on Spotify. And now, in a final painstaking tribute to these golden years of electronic music before I found SoundCloud, I am building this playlist to commemorate this music epoch. It was a doozy, and it continues to spill over into a decade later for me. It covers 2004-2009, it's really weird at times, and you may not like it but it gives me life. Yes indeed, this marks the end of my second semester at BrainStation. I have marked all the final projects, and it has been truly amazing to see how far the students have come from the start of the semester. It also reinstates my opinion that anyone can be a user experience designer because we all want to improve the processes that hinder our daily lives. 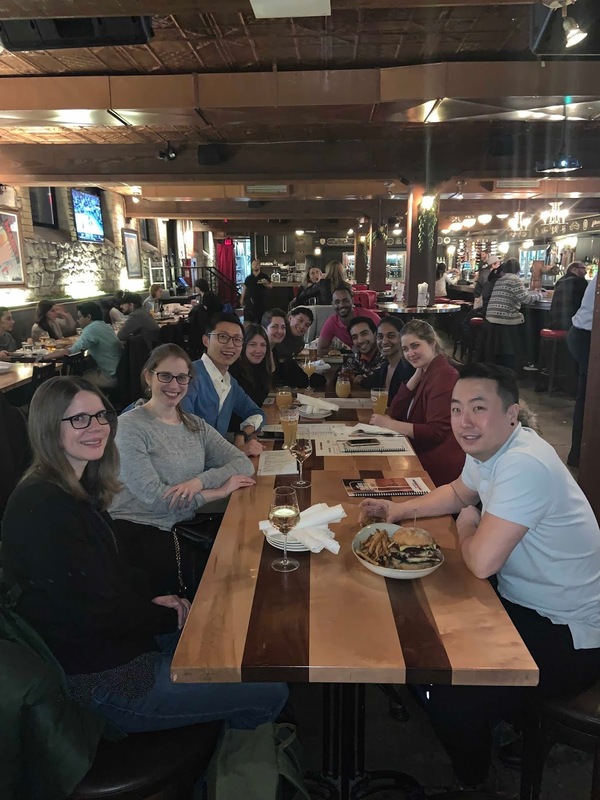 From a redesign of the process to report a pothole to the city of Toronto to an app that helps you discover new small businesses in your neighbourhood to a resource on cannabis use for seasoned and new tokers alike, I was so impressed to see the final projects. My class took me for a beer after our final presentations. My friend Laura was kind enough to invite me to check out a yoga studio near our workplaces in Liberty Village. I am about ten years out of practice and the studio only does hot yoga, and on top of that, we accidentally picked an advanced class. I am really proud of myself for not throwing up, it was that difficult. But I made it through, was sore for three days following, and now I know I don't like hot yoga! It did make me realize I like cool (even maybe outdoor?) yoga, especially at a beginner level, so maybe I'll look for an alternative. Saturday was a wonderful art crawl with my parents to the Ai Weiwei exhibit at the Gardiner Museum. I love pottery and china, and the Gardiner is such a gem of a place. I've spoken about it before, and you really must see Ai's exhibit there. We also checked out the beading exhibit at the Textile Museum, another absolute gem that has made it onto this blog before. Many of the beaded works spoke openly about their heritage in Native Canadian culture. Beading intricately covering racist depictions of Native Canadian dolls. This is so beautiful I might die. I especially enjoyed these beaded "Swatches" from artist Bev Koski. The left is Old Dutch potato chip bags and the right is the carpet pattern in The Shining. And in other news, I booked a trip to San Diego and Los Angeles! I have literally no idea what I'll do in San Diego for five days, but I'm staying near the Zoo and there are no less than 25 entries for the city on Atlas Obscura, so I'm sure I'll find some ways to pass the time. Plus, I get to take the Pacific Surfliner from one city to the other, with a potential stop in a third city on the way! 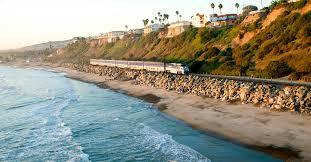 Who doesn't love a coastal train? Laura and Eric have booked a swanky dig in Los Angeles with a pool, which I'm gonna jump into as soon as we get back from the music festival (the heart of our trip activities). Quick shoutout to this music festival Just Like Heaven for providing a venue for many of my favourite artists of 2007 (the epicenter of the music epoch I mentioned above). I have three books due back soon to the library, plus another instalment of the feminist book club to prepare for, so I'd like to spend my time free from BrainStation this week to read more. The pile of books on my bedside table is becoming unmanageable, so it's time to do something about it. I'd also like to plan my California trip a little more formally so I have more things to look forward to! 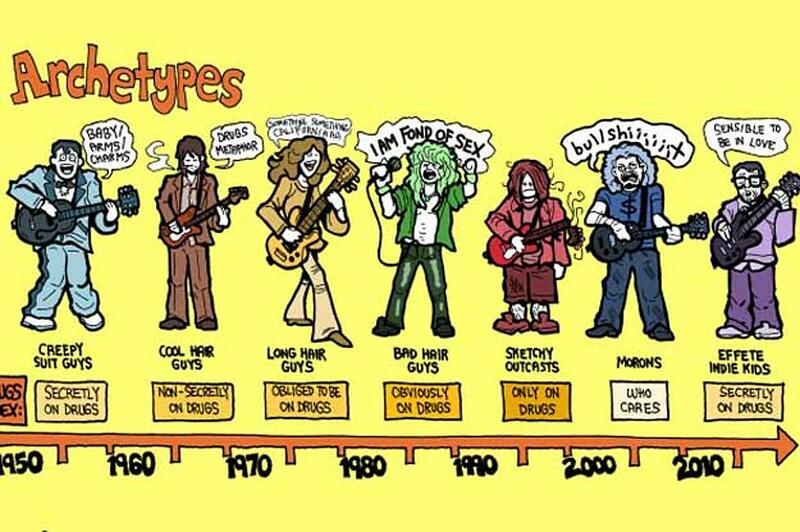 A history of rock music (according to some guy). I could talk all day long about my love of nostalgia, music epochs and the relationship between sound and memory. It's been a wonderful hobby of mine to create playlists that capture specific points in my music experience, and especially so to share them easily with others as Spotify offers somewhat seamlessly. I find it difficult to describe the eras of music I am most attached to, so creating these playlists allows me to explain them to others quite easily, but more importantly Spotify's interlinking of bands within a playlist allows me to explore the epoch further from the center and into its edges in a way I could never do with Google or YouTube as I did before. 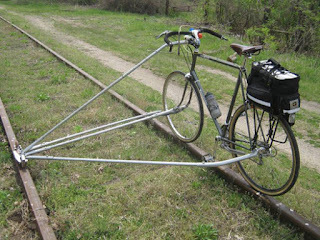 Yes, it's a bicycle attachment that counterbalances on abandoned railways and allows you to take day trips through beautiful forest scenery ALL WHILE pretending you're a TRAIN! I would love if this was the main transportation method in Toronto, it especially pulls at my heartstrings because it takes what I consider to be the scariest part of bike riding in Toronto and makes it a strength. No, I'm not talking about cars, I'm talking about streetcar tracks! The above bike hack was created by Will, a member of the forum BikeHacks.com. Read about his plight at the link above.